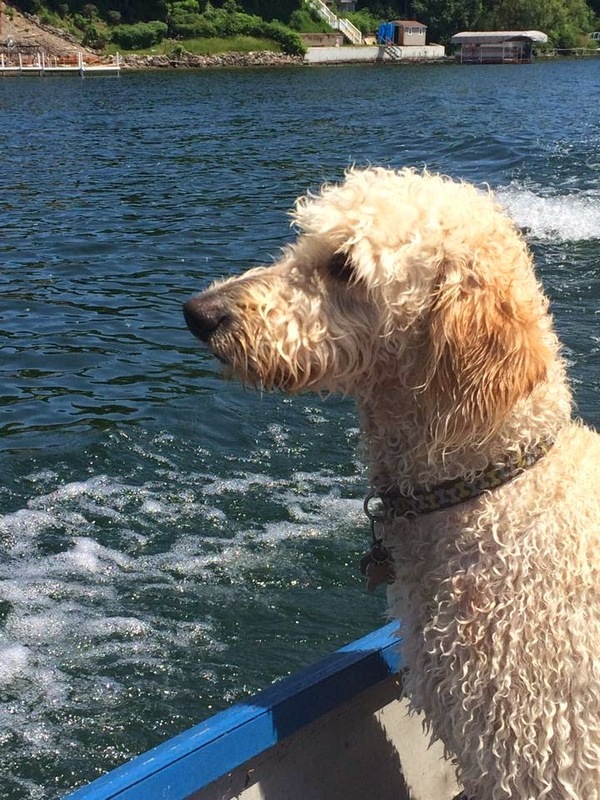 Goldilocks & Her Doodle: Dog Days of Summer! As I shared in yesterday's post, my husband, Jeff, and I will be spending this summer apart -- South/North-style. That being said, I am a little bit nervous that he will miss out on some integral memory-making moments with our big furry goldendoodle. When I decided to stay in New York for the summer, the topic of Milton was up for discussion. Me, being rather selfish, declared that Milton was, of course, joining me on summer vacation. Then I backtracked and thought of my poor dear husband twiddling his thumbs alone in our little brick house in the heat, so I graciously offered him the dood for entertainment and cuddling purposes. This is what I got in reply -- "Oh no. You take him. I want to be footloose and fancy-free." Uh huh. In my head, I am thinking, What the heck is that supposed to imply? Well, the Milt Dog is with me, and he is having an absolute ball! Beginning today, the very first day of summer, I will post a daily photo of our Milton, to mark the passage of the season and so Jeff will not forget the particulars of Milt's handsome face. That being said, the photo[s] will be short, sweet, and occasionally accompanied by a whimsical story -- the type of story that only long sunny days with a wet dog produce. Uncle Steve and Aunt Corey took the Milt on a boat ride upon arrival to the lake -- Wind washing over wet curls -- enjoyable! To you, my Jeffery, "A photo a day keeps the drearies away." For the multitude of other readers out there, enjoy the Milt's summer montage. Happy, Happy Summer to one and all!